Representative from Maryland; born in Towson, Baltimore County, Maryland, May 11, 1889; attended the public schools; was graduated as a civil engineer from Maryland Agricultural College (now University of Maryland) in 1910; studied law at the University of Maryland at Baltimore; was admitted to the bar in 1912 and commenced practice the same year; commissioned as First Lieutenant November 1917 and was assigned to the Three Hundred and Sixteenth Regiment of Infantry, Seventy-ninth Division, Camp Meade, Maryland; served overseas; resumed the practice of law in 1919 at Towson, Maryland; elected as a Democrat to the Seventieth Congress (March 4, 1927-March 3, 1929); unsuccessful candidate for reelection in 1928 to the Seventy-first Congress; resumed the practice of law in Towson Maryland; again elected to the Seventy-second and to the five succeeding Congresses and served from March 4, 1931, until his resignation on October 26, 1942, to become a judge of the United States Customs Court, in which capacity he served until 1952; member of the Board of Regents of the Smithsonian Institution 1940-1943; named a member of the Board of Regents of the University of Maryland in 1931 and became chairman of the board in 1944; appointed judge of the United States Court of Customs and Patent Appeals by President Truman July 10, 1952, and served until his death in Baltimore, Maryland, September 22, 1957; interment in Arlington National Cemetery. BALTIMORE, Maryland, September 22, 1957 – Judge William P. Cole, Jr. of the United States Court of Customs and Patent Appeals and a former United States Representative, died in University Hospital today after a long illness. He was 68 years old. A Democrat, he had served for more than a dozen years in the House of Representatives. He was first elected in 1926, while practicing law in his native Towson, Maryland. Defeated for a 1929-30 term, Mr. Cole was again elected in 1930 to the first of six additional terms, resigning October 26, 1943, to accept appointment by President Roosevelt as judge of the United States Customs Court in New York. In July 1952, Mrs. Cole was appointed judge of the United States Court of Customs and Patent Appeals in Washington. He was also a member of the board of regents of the Smithsonian Institution. Surviving are his widow; two brothers, L. Franklin Cole of Plainfield, New Jersey, and C. Walter Cole of Towson, and two sisters, Mrs. John S. Green, Jr., of Baltimore, and Mrs. Thomas I. Garey, Jr. of Washington. 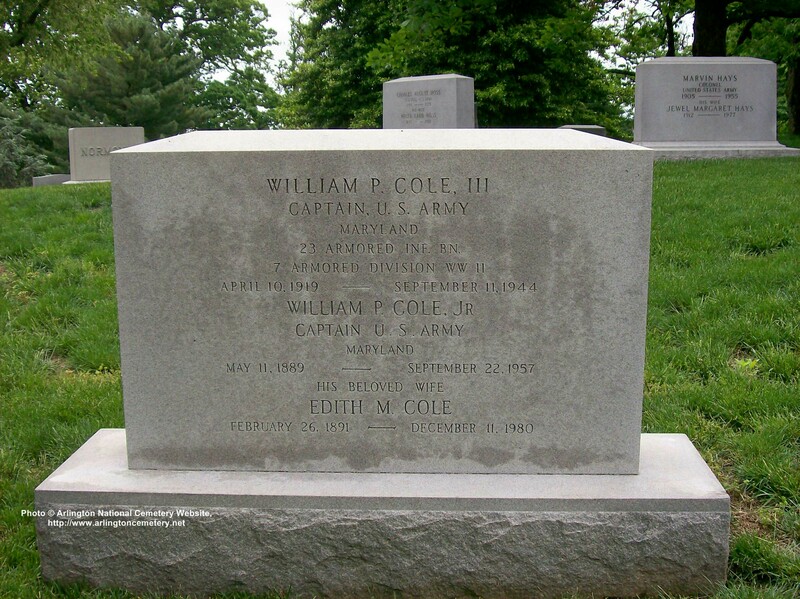 NOTE: His son, William P. Cole, III, Captain, United States Army (10 April 1919-11 September 1944) was apparently killed in World War II and is buried in the same gravesite in Arlington National Cemetery.